In 1845 it had become evident that members of the Church of Jesus Christ of Latter-day Saints (Mormons) would have to relocate again after repeatedly being driven from their homes in various places in the East. Prior to his death in June of 1844, church president, Joseph Smith, Jr. had discussed moving the Saints west to Oregon Territory or Upper California, which was under the control of Mexico. There was concern about how to move the members of the Church on the East coast on this exodus, as many did not have, and could not afford wagons for this trip. In the November 1845, Orson Pratt of the Quorum of the Twelve Apostles went to New York and selected a young printer by the name Elder Samuel Brannan to lead this company of Saints. There were rumors of a possible war with Mexico and it was difficult to find a ship to carry this group of Saints to the West Coast, because most of the ships didn’t want to commit to a lengthy voyage and possibly miss out on lucrative government contracts of transporting war materials. Over the course of two months, Brannan managed to recruit 70 men, 68 women, and 100 children – 238 persons total. Brannan negotiated a fare of $75 for adults and half-fare for children with the Captain Abel W. Richardson, master and a principal owner of the ship. 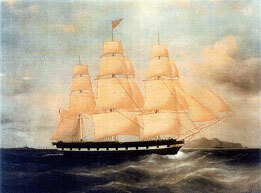 The Brooklyn was a cargo ship, which registered 445 tons and measured 125′ x 28′ x 14′ built in 1834. By sacrificing room for their own goods and allowing Capt. Richardson to fill the hold with goods bound for the Sandwich Islands (Hawaii), he would take them on the trip for $1500.00 per month. The ship was outfitted with a long table, the full length of the ship, for schooling, dining, council meetings, work, recreation, singing, and Sabbath services. Except for berths, there was no other seating. Hard, shelf-like berths were built on four sides below the decks in an area with low ceiling, restricted walking space, and cramped quarters, where the group would spend six months during their voyage. Stormy weather and other problems delayed their departure until February 4, 1846, (the same day as the Mormon Nauvoo exodus began) when the Ship Brooklyn finally cleared the New York harbor. During the voyage, they suffered greatly from cramped quarters. A tremendous hurricane blew them for three days. While the captain and crew were sure they would not survive the storm, the Saints were singing hymns, and sure that God would protect them. This group of people was ready to colonize a new area, as evidenced by the things they brought with them. A third of the cargo was machinery and tools sufficient to serve 800 men (including plows, plow irons, shovels, hoes, scythes, sawmill irons, nails and glass), a grit mill, a printing press (with a two year supply of paper and ink), a 179 volume Harper’s library, seed for planting, dry goods and merchandise for resale in stores to be established, textbooks for schools and livestock consisting of two milk cows, 40 pigs, and several crates of fowl. 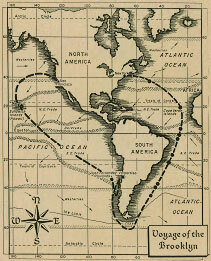 The voyage would be one of the longest religious voyages in history. The Ship Brooklyn sailed from Brooklyn Harbor, New York and traveled south across the Atlantic equator, around Cape Horn, stopping on Juan Fernandez Island on the West Coast of South America, then to the Sandwich Islands (Hawaii), finally arriving in Yerba Buena (San Francisco) on July 31st, 1846 having made the sea voyage in five months and twenty-seven days. This dangerous trek of nearly 24,000 miles would claim 10 lives of the ships 238 passengers, nine of which were buried at sea. Two children were born during the voyage. The passengers of the Ship Brooklyn left the United States with the hope of finding religious freedom. When they arrived in Yerba Buena, they say the –“Stars and Strips” flying over the town square. A United States naval officer, who boarded the Brooklyn as she came to anchor, informed them they “were in the United States of America.” Three hearty cheers were given in reply. 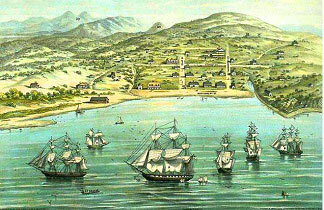 The officer was Captain Montgomery of the United States war sloop Portsmouth; he was then in command of Yerba Buena and the surrounding country. Three weeks previous to the arrival of the saints, the United States flag had been raised and the country taken possession of in the name of the government which the flag represented. This made this group the first ship load of immigrants to arrive by ship in the new territory under U.S. rule. For a time, San Francisco became largely a Mormon town, according to historian, Hubert Bancroft. They more than doubled the population and controlling seats on the city council. They would create the first English speaking school, first bank, first library and San Francisco’s first newspaper, The California Star, printed by Sam Brannan. Sam Brannan would later be excommunicated by The Church of Jesus Christ of Latter-day Saints. He would, however, play a key role in starting the Gold Rush of 1849 by his waving a vial of gold around the streets of San Francisco and announcing the discovery of gold at Coloma, on the American River, and announcing it in his California Star that he hired riders to carry east to the states. He would become one of the state’s first millionaires, was instrumental in developing the Napa grape and wine area, helped finance the railroad over the Sierras, and owned considerable real estate. After abandoning his beliefs and the principals of his religion, his life style changed to the degree that his wife divorced him and his life continued to spiral downward until he died penniless in San Diego. His body lay unclaimed in the county morgue for two years until a nephew came forward and buried him. Members of this group would settle the community of New Hope, in the San Joaquin valley and grow some of the first wheat in this area. John Horner, one of passengers, would become famous as the “Father of California Agriculture.” He did commercial farming in the east bay area and developed a ferry service to deliver the produce to the San Francisco area.